Home / Latest Iowa 80 Group News / Other Related News / 1938 Kenworth to Compete in Portion of Great Race Again! 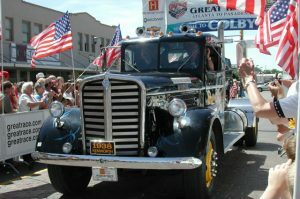 1938 Kenworth to Compete in Portion of Great Race Again! CAT Scale’s 1938 Kenworth will compete from Cheyenne, Wyoming to its finish in Moline, Illinois; and it is the only semi-tractor in the cross-country competition. Iowa 80 Trucking Museum is also hosting lunch for the racers on June 26th from 11:30 PM – 2:30 PM. Racers will then head to the finish line in downtown Moline. The public is welcome to view the cars during the lunch stop. The Great Race is a time/speed/endurance road-rally for vintage vehicles, manufactured at least forty-five years ago. The 2016 event will be run over nine days, starting in San Rafael, California on June 18th and ending on June 26th in Moline, Illinois.